Cranial-sacral work is a very gentle and non-invasive form of bodywork, which can be used either separately, or in combination, with traditional Chiropractic care. There is a measurable rhythmic pulsation (approximately 6-12 cycles/minute) within, and throughout, the central nervous system contained by the spine, sacrum, and skull, which is accompanied by other longer and slower wave patterns. When the mobility of the Cranial-Sacral system is restricted, altered, or disrupted because of injury, symptoms may appear. These can include jaw, tooth, facial, back, and neck pain; visual disturbances, hearing loss, tinnitus, sinus trouble, anosmia, insomnia, Bell’s palsy, trigeminal neuralgia, nystagmus, strabismus, and other cranial nerve dysfunctions, various emotional and thought disturbances, etc. Some of these dysfunctions may result from consequent neurological and/or vascular alterations. Dr. Hertenstein is an excellent cranial-sacral practitioner. He helped me with a stuck jaw and congenital scoliosis that have been problems for many years. He is gentle but effective and I would recommend his care to anyone seeking to heal or relieve pain. I spend a lot of time on the computer in my work. 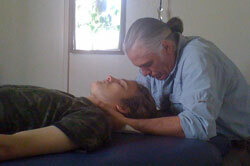 Using cranial-sacral work Dr. Hertenstein has relieved my, what felt like unmovable, chronic pain. He has improved my life, my work and my creativity. I can’t recommend him too highly! What Causes a Dysfunctional Cranial-Sacral System? Dysfunction may occur with head, neck, back, or more global somatic trauma, leaving scar tissue and/or traumatic tissue/neurological memory. Emotional shock and trauma may also contribute to, or be contained within, these events. This may restrict the Cranial-Sacral system’s ability to respond freely to its inherent rhythm. Damage can also be caused by a traumatic birth, extensive dental work, a bite imbalance, or chronic bruxing (“teeth grinding”). The skulls jigsaw puzzle-like system of moveable bones give upon impact which may, momentarily or permanently, alter skull function and leave distortional movement patterns. Boxer shown before the fight. Same boxer at the moment of impact. The Cranial-Sacral system can be released through specific gentle techniques directed at restricted areas, using diagnostic methods akin to “motion palpation” concepts applied to Cranial-Sacral dysfunction. Because the body has evolved to support a normal functioning Cranial-Sacral system, it tends to remain movable once it has been “released.” Without this help, not only is the body often unable to resolve these restrictions, it adapts to abnormal movement potentially leading to neurological, vascular, and/or biomechanical and organic complications. See ‘Birth Trauma’ for information on Children, Babies, Birth Trauma and Cranial-Sacral Injury. In Dr. Hertenstein’s clinical experience, the gentle techniques of Cranial-Sacral work are more suitable, and very effective, for such sensitive and vulnerable little one’s, especially when they have been traumatized on their birth journey. The techniques do not hurt and the work is very gentle. Seldom does the pressure exceed five grams (the weight of a nickel). All material copyright ©2009-2017 Dennis Hertenstein. All rights reserved.